Nancy Alice Roberts was born January 9, 1877 in Murray County, Georgia. She married James Alexander Hemphill on Christmas Day in 1897. They had nine children between 1898 and 1916. Alice was a charter member of the Chatsworth chapter of the Order of the Eastern Star. Three of her sons served in World War II. She died March 24, 1965. Alice appears in two of the collage photos; in the upper left corner, she is holding her first grandchild, and she appears with her three daughters in the bottom right corner. Alice was the third child of Martin LaFayette Roberts, who was born May 2, 1853 in Bradley County, Tennessee. Martin moved with his mother and siblings to Spring Place, Murray County, Georgia in 1865 after their home and businesses were burned by the Yankees during the Civil War. He remained in Murray County for the rest of his life. He married Rosa Ellis on January 28, 1872. They had eight children. Martin was a member of the Chatsworth Masonic Lodge and the Masonic logo appears on his headstone. He died April 2, 1925 in Chatsworth, Georgia and is buried at Spring Place Cemetery. Martin’s father, Monteville Roberts, was born April 27, 1827 in McMinn County, Tennessee. He and Mariah Langston were married on July 18, 1852. They had six children. He enlisted in the Confederate Army in 1863 and fought in the battles around Dalton, Resaca, Dallas, and Pickett’s Mill (all in Georgia). He was shot in the left arm and side with a minie ball at the Battle of New Hope Church, whereupon his arm was amputated just below the shoulder. Before the war, Monteville was a wealthy man; he owned a mill and a blacksmith shop. He was also a Mason, perhaps being the one to start this family tradition. He died on December 1, 1895 and is buried at Spring Place Cemetery. That’s Monteville in the top right corner of the collage. To the best of my knowledge, Monteville’s father was John M. Roberts, who was born about 1786 in Virginia. His wife’s name was Rebecca (possibly Sammons) and they had nine children. They appeared in Buncombe County, North Carolina on the 1820 census and by 1830 had moved to the part of McMinn County, Tennessee that later became Bradley County. John died about 1855. Roberts was the 43rd most common surname in the United States in 1990. 5% of the nation’s Roberts households lived in Georgia in 1920. In 1880, there were 3,552 Roberts in Tennessee and 4,746 in Georgia. 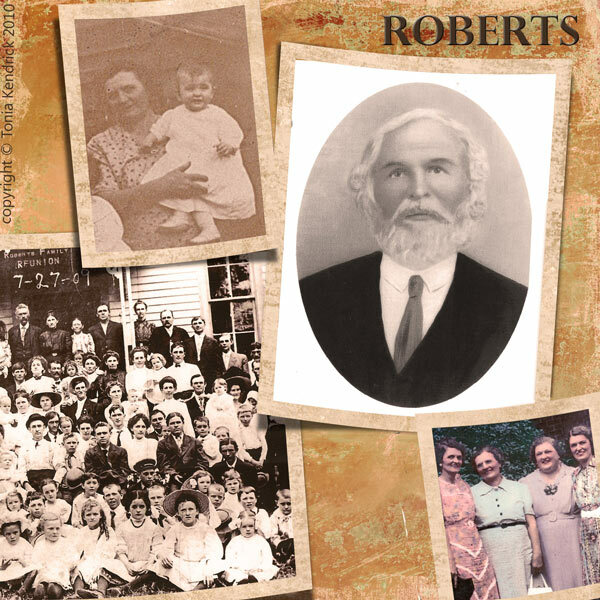 In 1840, the Roberts surname was most heavily concentrated in Ohio, Pennsylvania, and New York; nevertheless there were more than 700 families in Virginia, North Carolina, and Tennessee, representing 15% of the Roberts families in the United States. A complete list of deceased Roberts family members in my database. Posts about Roberts ancestors and relatives in this blog. Roberts documents, photos, and headstones. Check Social Security Death Index for Nancy Alice (Roberts) Hemphill. Check “Georgia 1790-1890 Census” database on Ancestry.com for Martin Roberts and Monteville Roberts. Check Murray County Probate records for Martin Roberts. Check Civil War Service records on Footnote.com for Monteville Roberts. If you have any additional information (or corrections) on this Roberts line, comments are most appreciated! Have you check out Reuben Roberts of Port Royal VA who went to Jones, Georgia, I think. When I first started searching my Reuben Roberts I would have to figure out which was which as they both served in the Rev. War. Just a thought. I just found your blog! Ironically, I just posted a entry about my Roberts line in McMinn, White and Van Buren Counties in Tennessee! William and Harriet (Owens) Roberts were married in 1844 in McMinn County and are listed on the 1850 census for McMinn County with sons James and George. I’m always interested in sharing Roberts info. We could be related! Hi Teri! Thanks for commenting. I bet we are related. Do you know anything about your William Roberts’ parents? No, the search continues for William’s parents!